Have you ever looked around your house and thought, "Why is every light in the house on!?" Make it a point to turn off the light when you leave a room. Might seem like a no brainer, but I'm willing to bet there's a lot of rooms out there where the lights are on, but nobody's home. Teach your kids to do it, too. Since little ones like light wherever they go, teach them to turn them off when they leave the room. If they go right back in, they can turn them back on. Always make sure the lights are off when you leave the house and/or go to bed (unless you keep one on for safety reasons). My challenge is to use the natural light more often...which can be hard to do in an apartment, but we're gonna try! And again with the no brainer, but not only are you saving energy...you're also saving money. What lights can you turn off right now? 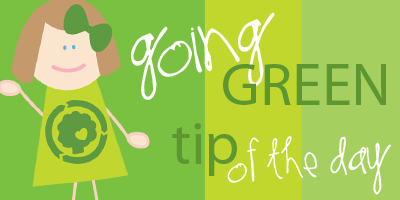 Going Green Tip of the Day: Sign this Petition!